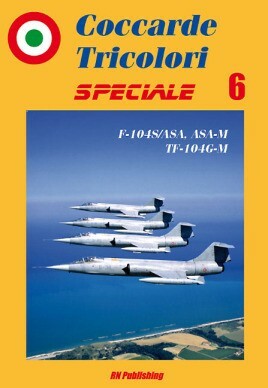 This latest title of the "Coccarde Tricolori Speciale” series completes our trilogy dedicated to the F-104 Starfighter in Italian service. The book, which includes previously unpublished photos and information, is divided into several chapters, dedicated to the technical testing and development, to the operational service in Italy, to a large photo album (including air-to-airs, all the color schemes, marking variations, special colors, phases of the operational activity, all pictured with dramatic shots) a modeling section, with information and 19 color profiles, and photographic details of the real aircraft. In the appendix, there is a list of all the F-104S and TF-104G modified to the ASA, ASA-M and TF-104G-M standards. A must-have to complete the Italian Starfighter story! 136 pages, text in Italian and English, hundreds of black/white and color photos, 18 color profiles and 1 four-view drawing.